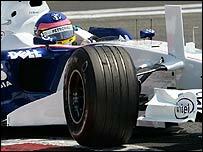 Jacques Villeneuve's new-look car led a BMW Sauber one-two in Saturday practice for the French Grand Prix. The former world champion clocked one minute 17.005 seconds, finishing ahead of team-mate Nick Heidfeld while Toyota's Jarno Trulli was third. But Renault struggled on their home track with Giancarlo Fisichella 11th quickest and Fernando Alonso 16th. Michael Schumacher was 14th after a fire broke out in his Ferrari and Briton Jenson Button's Honda was sixth. The new-look BMW Sauber had also topped the timesheets in Friday's practice sessions with test driver Robert Kubica behind the steering wheel. Canadian Villeneuve, who won the title nine years ago in 1997, achieved his fast time on Saturday with two vertical fins on the nose of his car, in front of the cockpit. The aerodynamic "winglets" are designed to improve airflow over the car. But Schumacher managed just five laps before flames licked around the exhausts and his mechanics scrambled to find a fire extinguisher. Ferrari mechanics worked feverishly to repair the damage and avoid an engine change, which would bring a 10-place grid penalty. World champion Alonso, who leads Schumacher by 19 points in the standings, had been the fastest race driver a day earlier but was also off form on Saturday. His Renault spun at the Adelaide hairpin at the very end of the session, ruining his quickest lap and slumping to 16th. McLaren's Pedro de la Rosa, standing in for dropped driver Juan Pablo Montoya, warmed up for his first qualifying session for more than a year with eighth quickest, one behind team-mate Kimi Raikkonen. Scotsman David Coulthard was 10th.